Oriental rug cleaning, area rug cleaning and tapestry cleaning We professionally clean every type of Oriental rug and area rug - inexpensive floor coverings to Navajo rugs to valuable Persian rugs. Talisman's immediate service area is the greater San Francisco Bay Area - including the North Bay, the South Bay and Monterey. Although Talisman is a local San Francisco Bay Area service, Oriental rugs and tapestries are sent to us for cleaning and restoration from throughout the United States. All area rugs are exclusively and thoroughly cleaned by hand No rug washing machines, no carpet steam cleaning, no machine brushing. Never take a risk - ask! 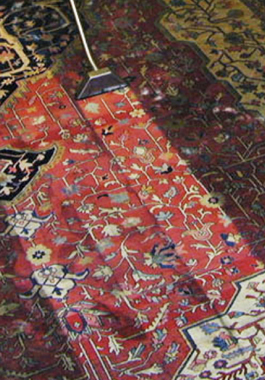 Improper cleaning is a leading cause of damage to Oriental rugs. Comparable prices Pricing is low and competitive - even with Talisman's extensive care, time and attention. At these prices, you can afford to choose the very best. Other Oriental rug cleaning services charge the same or more, but offer far less. See our References. You may never know the difference until it's too late. Incomparable quality Protect your health and your investment! Talisman's Oriental carpet cleaning methods are founded upon museum science and are universally recognized as the defining standard of excellence. The result is a more reliable, satisfying experience – and fewer cleanings in the future. For a reference, speak to any designer, Persian carpet dealer, museum or Oriental rug society about Talisman Oriental Rug Cleaning. Know the difference before you decide! Serving the San Francisco Bay Area and Monterey Bay Area since 1980 Weekly pick up and delivery throughout the nine San Francisco Bay Area counties. "The finest quality conservation services outside the museum environment." San Francisco Bay Area Oriental rug cleaning, Larkspur, Marin rug cleaning, Mill Valley, Berkeley Oriental rug cleaning, Oakland Oriental rug cleaning, Montclair, Piedmont rug cleaning, Ross, Hillsborough rug cleaning, San Mateo, Palo Alto rug cleaning, Saratoga, Portola Valley rug cleaning, Menlo Park, Woodside rug cleaning, Lafayette, Atherton rug cleaning, Walnut Creek, Los Altos rug cleaning, Alameda, San Jose rug cleaning, Monte Sereno, Los Gatos rug cleaning, San Rafael, Santa Cruz Oriental rug cleaning, Monterey/Carmel rug cleaning. We pick up throughout California by appointment.